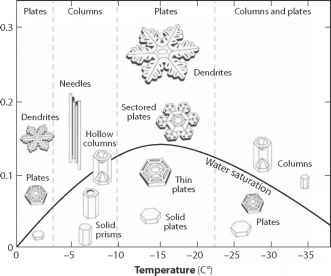 Snow and ice are the most reflective natural surfaces on the planet, exceeded only by clouds in their influence on planetary albedo. This reduces the net solar radiation that is available to warm the Earth, lowering the mean annual temperature of the planet. The cryosphere also introduces regional and seasonal variability in the absorbed solar radiation that is available. Surface albedo effects of the cryosphere have the greatest impact on regional and local climate through cooling and through influences on atmospheric circulation. The seasonal evolution of snow albedo and the transition from seasonal snow to ice cover on sea ice and glaciers create strong increases in ablation as the melt season progresses. Darkening of the surface causes a three- to four-fold increase in the net shortwave radiation that is available for melt, as illustrated in the surface energy balance example of chapter 3. This feedback drives greater rates of melt in the late summer, contributing to the lag between peak insolation and the annual sea-ice minimum (September in the Arctic and March in Antarctica). This same lag causes runoff from glaciers and ice sheets to peak in late summer. Seasonal snow cover is the most variable feature of Earth's land surface, with albedo feedbacks serving to amplify the solar-driven seasonality at midlatitudes and high latitudes. In the winter months, insolation is weak or absent at high latitudes, muting the effects of snow cover; the influence of snow and ice on local energy budgets is therefore greatest at midlatitudes. The impact of snow and ice on the planetary energy budget can be estimated with a number of assumptions. A simple representation of the global energy balance is possible through an adaptation of the linearized, zonally averaged surface energy balance explored in the 1960s by Budyko and Sellers. We consider this here by discretizing Earth into 5° latitude bands, with the zonal mean topography, land fraction, and land/ocean surface properties calculated for each latitude band, 6.. Each zonal band has a distinct area, albedo, and total heat capacity, A., a., and C. (J m 2 K1).